Tia Betty Blue’s is a small New Mexican café in what some call Albuquerque’s “International District” but I call “over by base,” meaning it’s kind of by Kirtland Air Force Base. It’s on the east side of San Mateo, between Gibson and Kathryn. 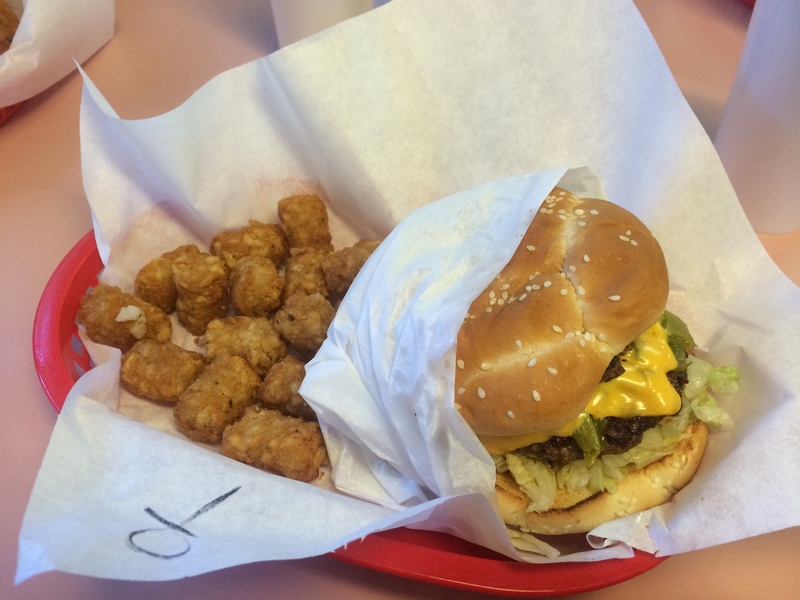 Sometimes you just need some comfort food. 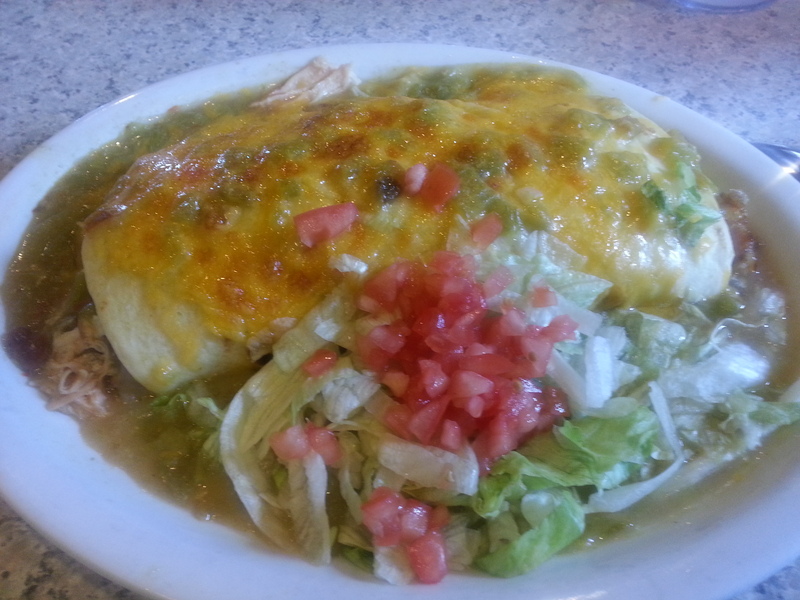 Maybe for you that’s a burrito the size of an actual small burro, smothered in cheese and green chile. 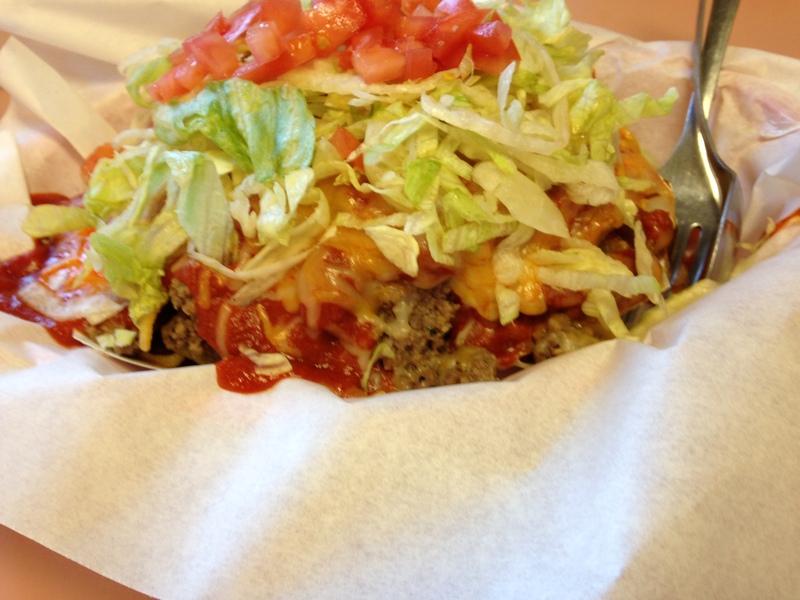 Maybe it’s a Frito pie or a waffle. Sometimes you just need a friendly young waiter or waitress to smile at you and bring you things, in a quaint little eatery smaller than your typical Starbucks. Tia Betty Blue’s has all this and more. 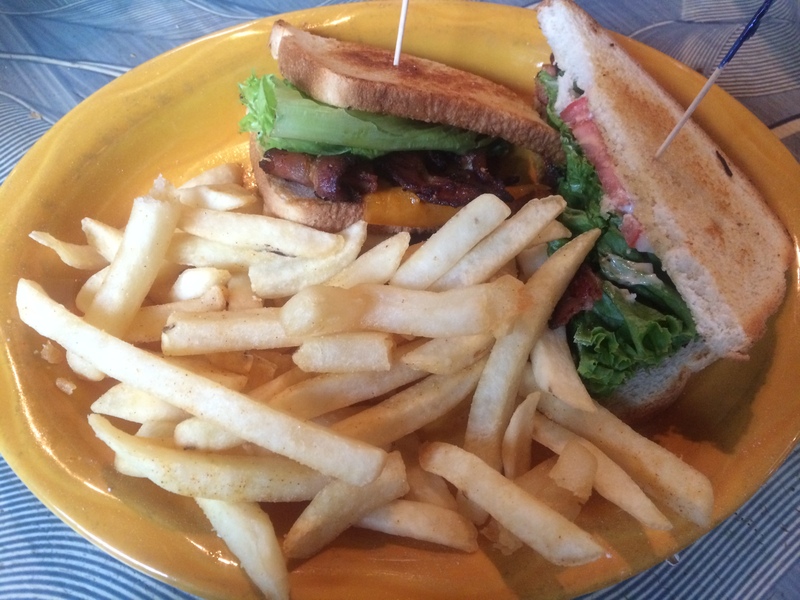 Specializing in breakfast and lunch (open until 2:00 p.m.), they serve a wide variety of typical NM breakfast/lunch entrees, like waffles, breakfast sandwiches, taco plates, and enchiladas. But what they do that sets them apart is take these café staples and give them a little twist. There is something about a fluffy, crispy, chewy waffle that makes my heart go pitter-patter. And Tia Betty Blue’s has elevated the already quite elevated garden variety waffle by making them out of blue corn and serving them two ways — sweet or hot. HOT WAFFLE: What’s that you say? A spicy waffle? Is it a waffle cooked with chile in the batter? No (but there’s an idea!). The Hot waffle is basically huevos rancheros, but with a waffle instead of a tortilla on the bottom. 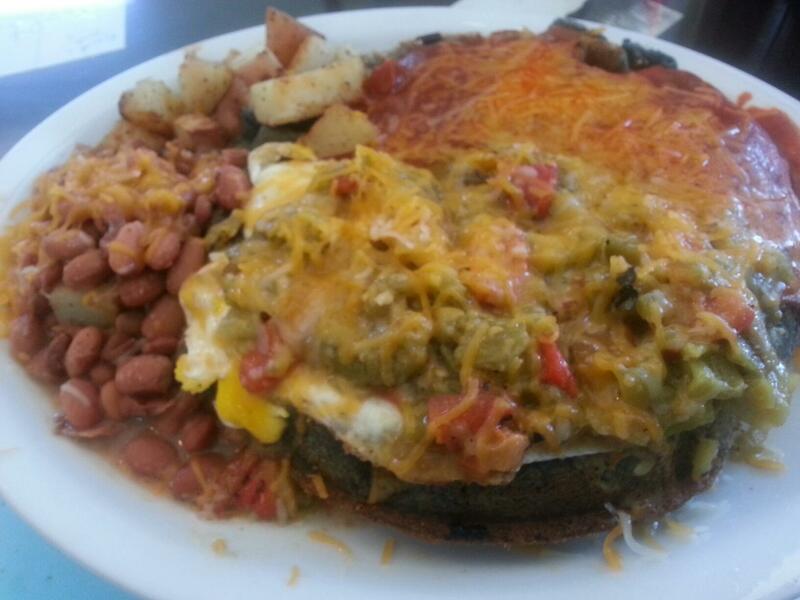 It is the blue corn waffle, topped with an egg, red or green chile or both, cheese, and your choice of meat if so desired. The sides are papas and beans. You’re Hot. No, YOU’RE hot, hottie. This waffle is hotter, though. I’m not sure where the “Frito Pie” was born, but I have met people from seemingly all over the country who have never heard of it. Which makes me sad for them. Frito Pie was — and still is — a cold weather staple in my family, akin to chicken soup or green chile stew. It’s just something you make every now and then when you want an easy, warm, and delicious (but not nutritious) meal. For those not in the know, a Frito Pie (or Frito Chili Pie) usually consists of a base layer of Fritos, then the chili (typically of the chili-n-beans type), then shredded cheddar cheese and diced onion. Iceberg lettuce and diced tomato are optional. And maybe some more fritos on top. But at Tia Betty Blue’s, they take this simple bowl of chili and turn it into chile. That’s chile with an E.
They start with Fritos, naturally. But then they do something so crazy but so simple, I’m surprised I haven’t seen it on a menu before. 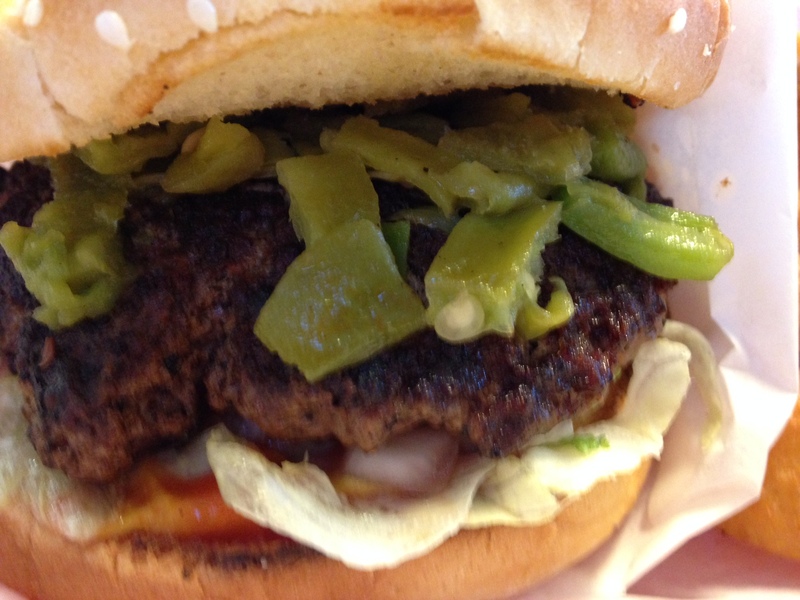 They add New Mexico chile (red, green, or both) — instead of the standard chili with an I. 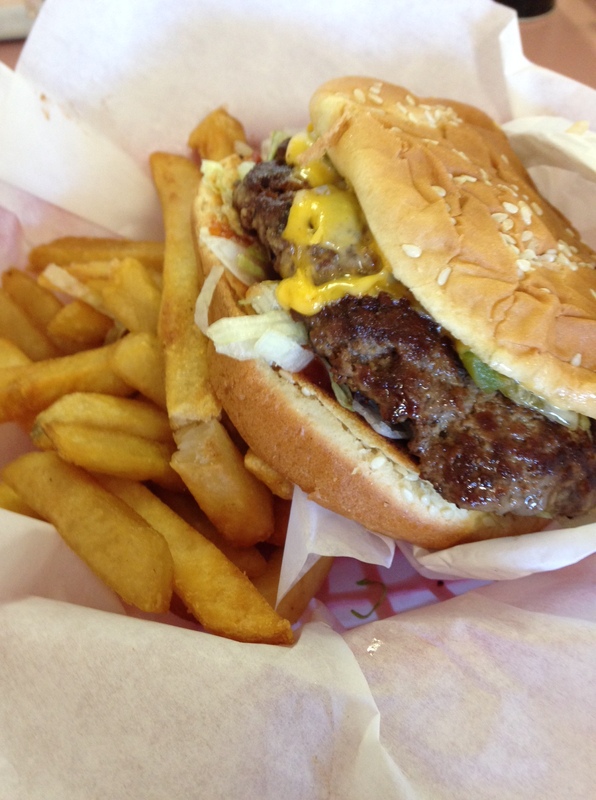 Then: cheese, onion, iceberg, tomato, per tradition. Loved It! The day I was there, the red was very hot, and the green mild but with fantastic roasted flavor. The fritos gave it the perfect salty crunch, and the garnishing iceberg helped to cool things off. 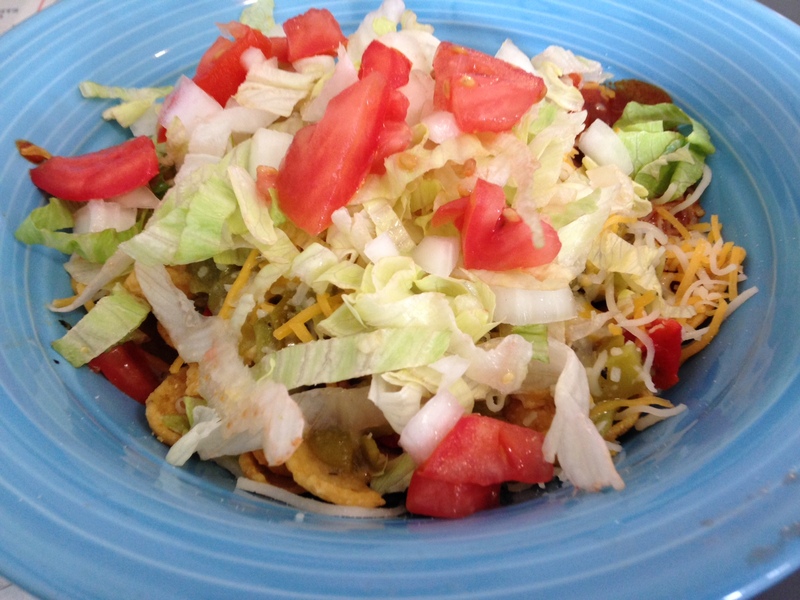 Frito Pie featuring Tia Betty Blue’s red and green chile. YES. Tia Betty Blue’s is very proud of their coffee. I love coffee, so I’m not sure why I haven’t tried this yet. They also have a big cooler full of unique sodas (think: juniper berry soda, key lime cream soda, cucumber soda, etc.). I love sodas, so I’m not sure why I haven’t tried these yet. Tia Betty Blue’s does New Mexican food in a way that is both traditional and unique. They try new things, but not just for show. The new things they are trying make perfect logical sense, both to the brain and to the taste buds. The atmosphere is casual and friendly. The prices are reasonable. A chile relleno is a hard thing to master. You have to get the ratio of cheese to chile to breading just right, or you end up with a mess. Too much breading and it’s heavy. Too much cheese and you lose the chile. Too much sauce on top and you get a soggy mess. 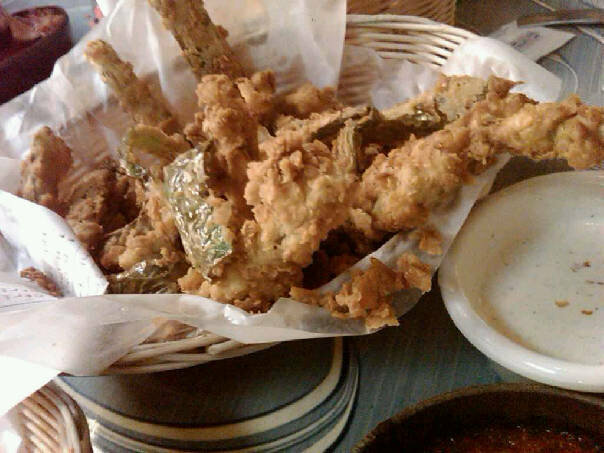 For me growing up, chile rellenos were always crispy, served right out of the grease with just a hint of red or green on top. My dad would stand over the stove, one hand holding a slotted spoon poised over the pot of popping grease, the other hand held out for balance, it seemed, all fingers thickly coated in batter and flour. As soon as a relleno turned a medium brown, it was scooped up and served. Letting it sit on a stack of paper towels for a moment was allowed, but only long enough to let a little oil drip off. Not long enough for it to cool down or soften in its own juices. Most times I go to a new (new to me) Mexican or New Mexican restaurant, I get a combo plate of some kind. I usually look for the combo plate that includes a taco, enchilada, and relleno. It is the crispy, rightly-ratioed version of the relleno of my childhood that I’m looking for. Most restaurants get it wrong*. The typical problem is an overabundance of batter, more pancake-like than anything else, and/or an overabundance of sauce on top — a “smothered” relleno is a soggy relleno. Or they use a Poblano pepper. And that’s just weird. But Cervantes…. Cervantes gets it right. I ate at Cervantes in early July 2014, and in true Me style, ordered a combo plate with relleno. 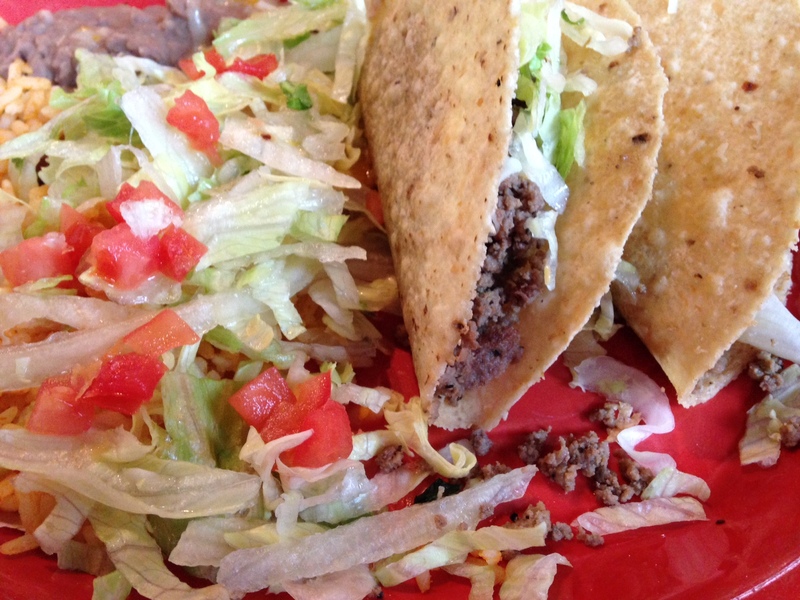 NOTE: Thank you, Cervantes, for putting the taco on its own little plate. 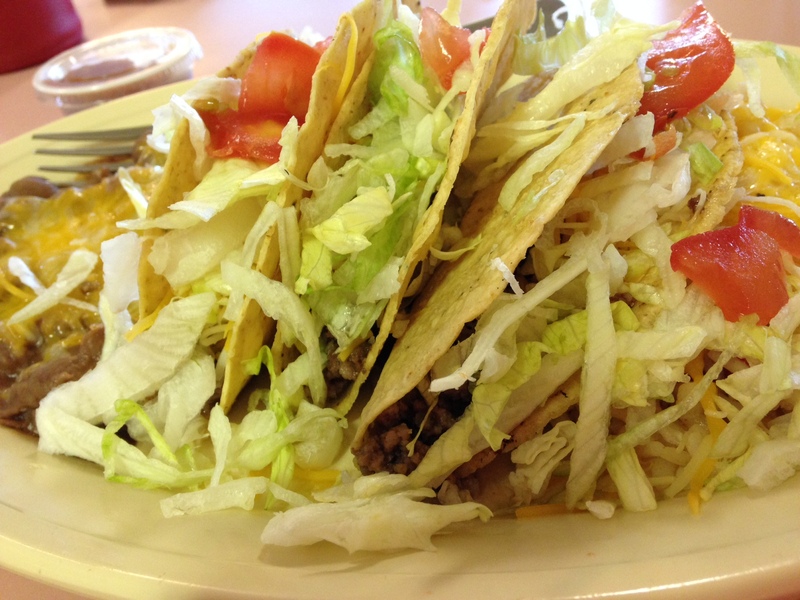 Many restaurants put the taco alongside everything else (between the enchilada and beans, for example), which means the bottom of the taco sits in the bean juice and red/green sauce until you pick it up, at which time it promptly falls apart because the integrity of the shell has been compromised. 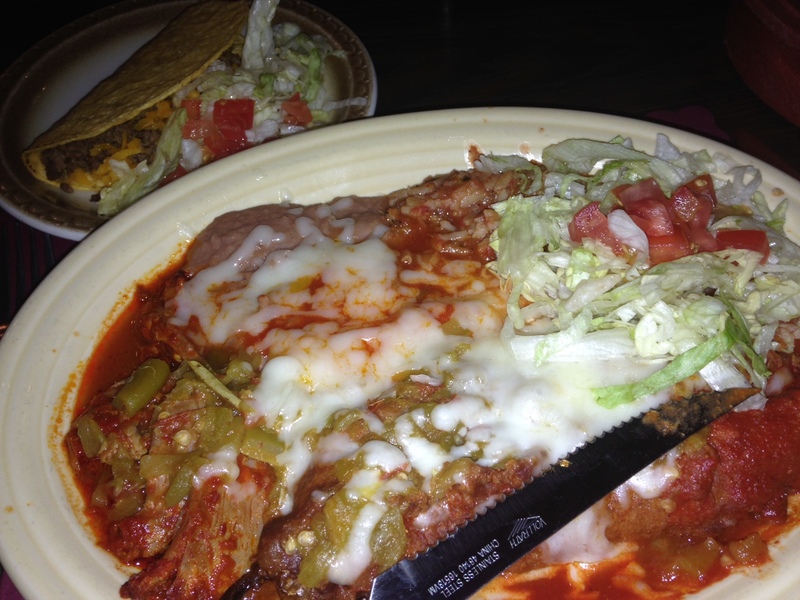 I was thrilled to have found what I consider to be a properly cooked (and delicious) chile relleno at Cervantes. 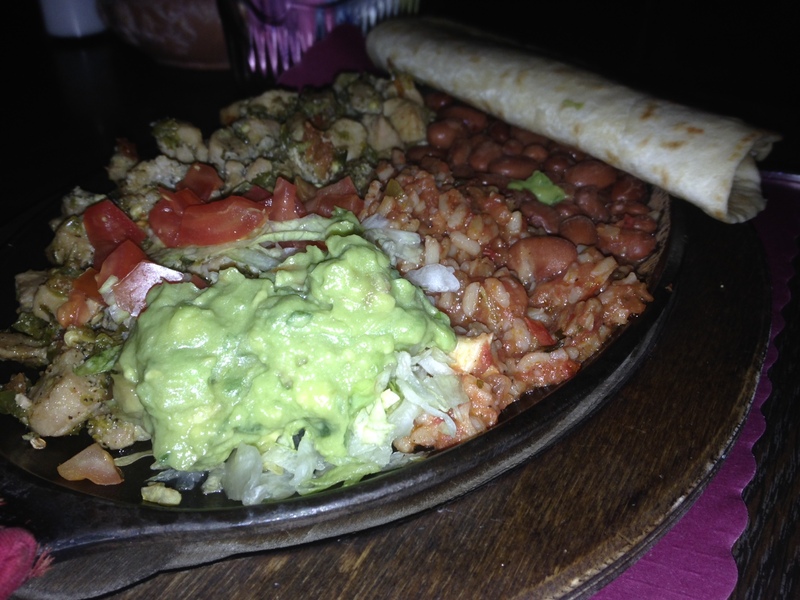 The combo plates come with the typical sides of beans and rice, but also with a little dollop of carne adovada. The carne adovada (shredded pork in red) was absolutely the best thing on the plate, and that’s saying something. I was disappointed that there was only a little scoop – maybe 1/3 cup. Next time I will order more adovada. Carnitas plate: Cubed pork in a roasty green chile sauce. Served with RIB and hot, homemade flour tortillas. It was really good! 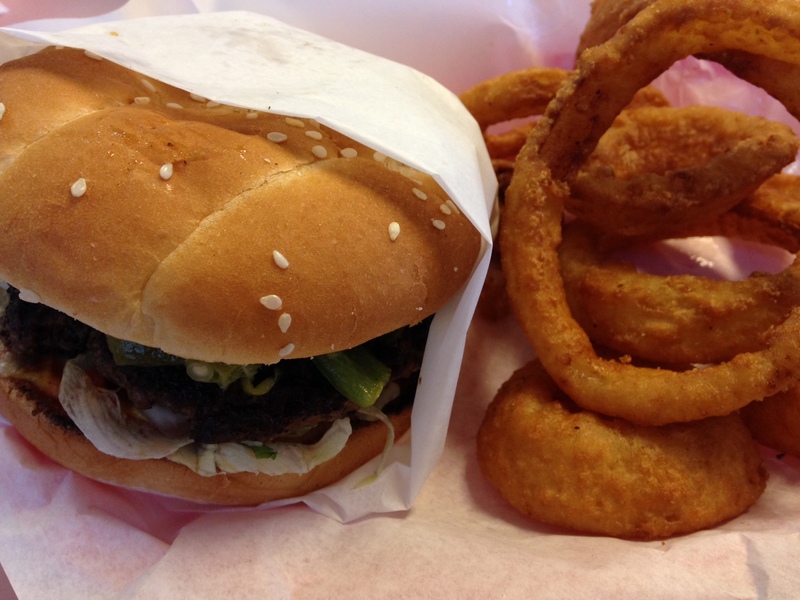 Peppery, porky, green chile-y, but not spicy. (If you want spicy, you have to get something with red.) The flour tortillas were fantastic! The meals also come with sopapillas, which makes me beyond happy. The sopapillas are a little bit dense, but still delicious, and they are served with local honey. 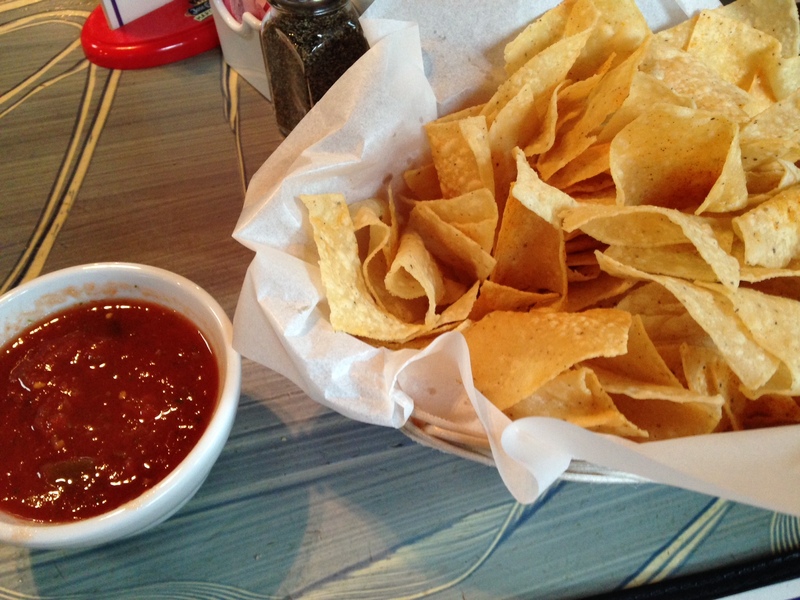 The red chile is hotter than the green, and the day I went it was pretty spicy. Not “OMG Bring Me Milk Now” kind of hot, but it was spicy enough for me to take notice! Just the perfect amount of heat. I ordered my meal Christmas style, and the green chile was super flavorful, but not at all spicy. 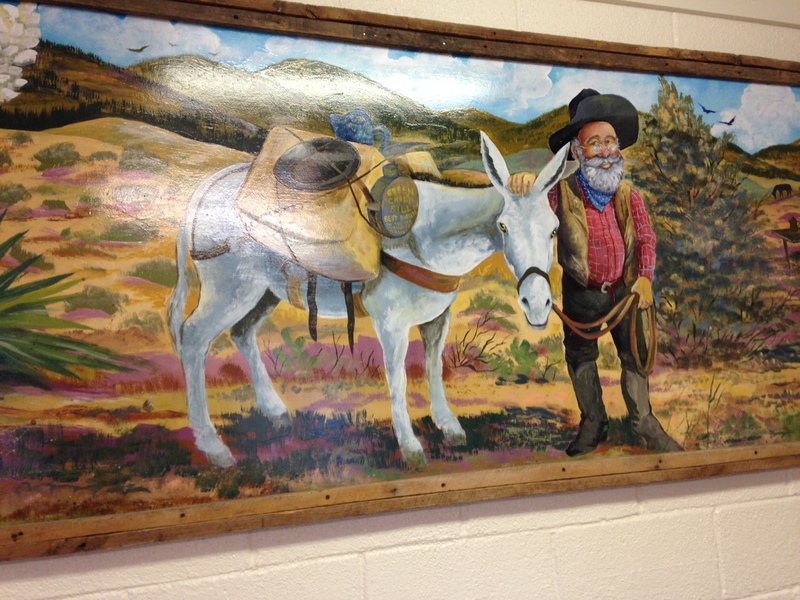 Cervantes has been around a long time – according to the sign outside, since 1973. The building exterior and the neighborhood are not impressive. Which is pretty typical of really awesome NM restaurants. The slightly shady neighborhood and run-down looking building and abandoned Pizza Hut building next door let you know you’re in for a treat. The google internetz machine calls this the “International District.” Having lived and worked in Albuquerque for a long time, I would call this the “Base District” (or probably just “Over by base”) because it’s right outside Kirtland Air Force Base. Specifically, outside the Gibson/Louisiana gate, at the corner of Gibson and San Pedro. This makes it an easy lunch for anyone working at Kirtland, but also puts it within easy reach of UNM, Nob Hill, and even the airport. The interior is kind of dark and cozy and typical of a legit New Mexican restaurant. Not trying too hard, but trying enough. The walls are hung with lovely local art – paintings of adobe in the snow, and the like. I visited Cervantes in early July, and the interior was decked out in July 4th décor. And not just the obligatory flag here and there – they go all out. And from what I’ve heard, they do this for all major holidays. I’d like to go back around Christmas. Cervantes is really really good. It is legit, authentic, traditional New Mexican food, with excellent red chile and a chile relleno — (almost) just like you’d get at my dad’s house. *Yes, after decades of searching for a relleno cooked the “right” way, and 95% of the time finding rellenos cooked the “wrong” way, it has occurred to me that maybe my family and I make and prefer our rellenos the “wrong” way. But I’m sticking with this, regardless. It looks kind of smushed because I had already picked it up and taken a bite before I remembered to take a photo.